Phoebe Phillips was first introduced to weaving by her mother who led women’s creative groups making woven baskets. Drawn to the meditative quality of this slow-paced creative practice Phoebe uses found and recycled fibres as the starting point for the design of her beautiful pieces of art. 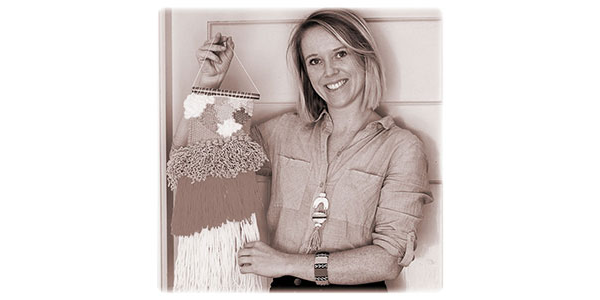 Vintage textiles, modern art and the colours of the Australian outback inspire Phoebe’s work. She is also interested in weaving as a cultural practice, and how it has been used amongst different groups and communities around the world. Phoebe created the “Sunday Weaves” weaving community as her idea of a perfect way to spend a weekend. A space where you can slow down, drink good coffee, have a great conversation and immerse yourself in a creative project. We are blessed at The Sound Temple to have Phoebe Phillips join us to host a workshop in Perth Hills as part of our Common Threads project. Common Threads – Woven through Community is a month long community engagement project proudly brought to you directly following the World Fashion Revolution week held in late April each year. This exhibition includes topics of integrating sustainability, creativity, and traditional hand-crafted wisdom of the ages. These events are designed for you to leave feeling deeply inspired to become part of a brand new impulse of considerable change. Photo by Cheryl The Makers Portrait.